The last half of July and August were about to keep us very occupied. First thing was a visit from our friends Gary and Becky Miller who own Kool RV Sunscreens. They have been friends of ours, good friends, for many years. I can’t remember where or when we first met, but I am pretty sure it was here at DCMR. Was it when they made tire screens for us? Anyway, we meet up in Florida most years and here in Galax also. This day we decided to head to the Twisted Fork Bistro for dinner and look at a lot of really good looking antique cars. The first Galax Cruise in was in full swing. Afterwards we visited the Galax Smokehouse for a large sweet tea and a cup of their Famous Banana Pudding. Steep Canyon Rangers, and lots of cars to park. The Steep Canyon Rangers is the biggest show of the Blue Ridge Music Center outdoor concert season. This would be our third time to see them and we have fun and love them each time. This concert was a bit different for me. I would miss the opening act because I am a BRMC volunteer and would be one of the folks parking cars. The New Ballards Branch Bogtrotters are a great old time music band that Diane and I have come to appreciate very much. After helping park about 1500 cars, I took my aching feet and my hot and tired body to where Diane and some of our DCMR friends were seated. I sat down and listened to the Bogtrotters’ last number. Then the Steep Canyon Rangers took the stage. As expected the next ninety minutes was great. I was not too tired to take some pictures. We had so many things to do and see over the next several weeks, it almost made my head swim. Lucky for me Diane keeps a good calendar in her head and on her tablet. So what was first, my records are visual, so let me scroll thru my pictures, oh, now I know…..
A new trip on the New River. Our friends Gary and Becky found what they thought was a great deal on a couple of new single inflatable kayaks at a big neighborhood yard sale. They also got a great deal on a couple of new PFDS (personal flotation devices also known as life vests). There was only one problem, they were just a bit too small, the kayaks not the vests. The boats were just not rated for adults, not in my opinion anyway. I think they agreed because after one trip down the river with us, they purchased a Sea Eagle SE 370 pro just like ours. So to sum it up, the first trip was a bit rough but good enough to tell our friends that with the right kayak, they could have some fun and enjoyment, which they did the next time they drifted down the New with us. It’s a great way to spend a warm afternoon, an easy paddle on a cool mountain river. A luthier is someone who builds or repairs string instruments generally consisting of a neck and a sound box. The word "luthier" comes from the French word luth, which means lute. A luthier was originally a maker of lutes, but the term now includes makers of stringed instruments such as the violin or guitar. From Wikipedia. Why did I add the above paragraph? Keep reading and you will find out. Sometime in July, I don’t remember the exact day, on my way home from CCSA or Lowe’s, or somewhere, I dropped into Jimmy Edmonds Guitar Shop. Jimmy is a true Luthier with a capital L. He creates wonderful guitars, fiddles, mandolins, dobros, and on rare occasion he will build a dulcimer. I know that because on this day I asked him if he would build one for Diane, a Galax style dulcimer. To my surprise, he agreed to think about it, and we agreed that Diane would come back to see him. A day or two later we went to his shop and carried both her dulcimers. She needed work on the one she intended to compete with at the Alleghany County Fiddlers convention and the big one as well in August, the Galax Old Fiddlers convention. We left her Mark Eubanks built dulcimer with Jimmy for some new strings and some adjustments to the frets. I am not sure what was done, Diane and Jimmy were talking terms that meant a lot more to them than me. I am an F-Stop kind of guy. They also discussed what she wanted in a new dulcimer, the shape, the wood, a lot of things. The four month creative process for a new dulcimer had begun. Now it was time to prepare for the Sparta competition. Our friend Bob brought Diane a flyer about the Alleghany County Fiddlers Convention in Sparta North Carolina. That one thing led to another and she decided to compete. Ed, a guitarist, readily agreed to accompany her again. I think he really wanted to after missing the chance to do so the year before at the Galax Fiddler’s convention due to a medical emergency. They practiced together and they choose the number they would play. It was a very old song called “Over the Waterfall”. The convention took place over a weekend, Friday and Saturday. Solo instruments were asked to perform on Friday, Bands on Saturday. Diane complied but as it turned out, she was the only dulcimer player who did. Diane and Ed had some time to warm up, then it was their turn to take the stage. With a lot of our DCMR friends in the stands cheering them on, Diane and Ed played Friday afternoon, and nailed it. Diane and myself were not at the Saturday Competition because of a previous commitment. She had agreed to play dulcimer for Chestnut Creek School of the Arts Plein Air Painting Event at the Summerfield Farm in Elk Creek. There were not many artists or other people there, but those that were including the farms owner enjoyed Diane’s music. There was one young lady there, a classically trained violinist who had switched to playing bluegrass fiddle tunes. She payed careful attention to Diane’s instrument and its sound. It seemed to be a very fitting place to play a traditional mountain dulcimer. We made it back to Sparta about seven pm on Saturday night. We discovered that the competition had a rain delay. A summer thunderstorm with lightning close by, had drenched the fairgrounds and the surrounding area. This meant that the final band competition and the handing out of awards would go mighty late. And it did. If there were any other dulcimer players there I didn’t see them in the crowd. The comptition registration folks couldn’t tell me just how many there were. We would just have to wait and see what happens, and it was long wait. The bands were good so we didn’t mind, not that much anyway. Here are couple of bands, Blue Grass and Old Time. At some point I just might explain the difference to you big city folk. Around One am on Sunday Morning the awards were announced. Diane received 5th place out of how many over six we still don’t know. After watching Youtube videos of some of the competitors, I think she should have been awarded higher, but I am very biased! Diane has competed twice, first time she was awarded 6th, second time 5th, that in and of itself is something for her to be proud of. I certainly am! The last Saturday of the month found me back at the Blue Ridge Music Center helping to park cars again. Rhiannon Giddens was performing and it looked like the attendance would be just about as large as the Steep Canyon Rangers Concert. There was no opening act, she had the whole evening to herself and her musicians. It was a great evening, a mix of Old Time, Gospel, Jazz and Bluegrass with a couple of Torch songs as well. I hated for it to end. August started out really nice. The second is my birthday and our Friends Bob and Sandra’s anniversary. We went to Shelton Winery in Dobson to celebrate both. That Saturday Diane and Ed jammed with the musical folks at the music center. That is always a treat for all of us. Week of the Big One, The Galax Old Fiddlers Convention. Fiddlers Week started off for us with Wayne Henderson and Friends performance. Wayne, a great guitar builder and musician is also a good storyteller. I think I inspired one that day. I mentioned to him that I saw he was paid in advance for the concert with a good sized mule egg. Wayne knew exactly what I was talking about and related a story to us all about his brother and a mule egg. That story received a good laugh and the music got a standing ovation. Wednesday Night, The Dulcimer Competition! Wednesday night started first with the Blue Grass Fiddlers, then came the dulcimers and finally the Bluegrass Banjo players. I, obviously, was more interested in the dulcimers than anything else that whole week. 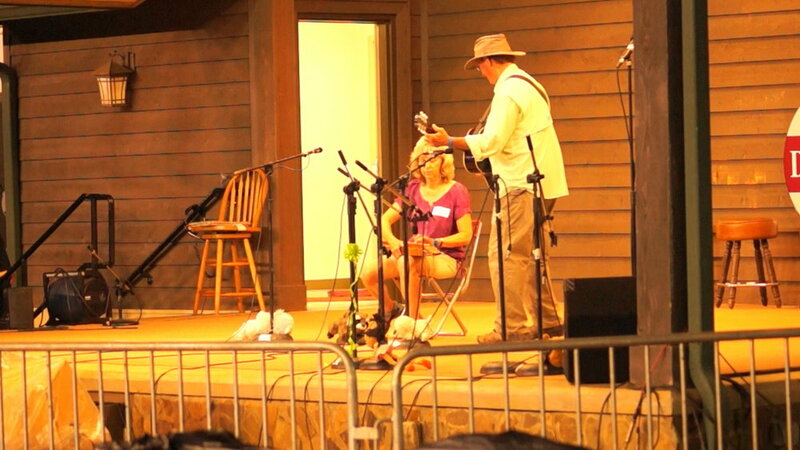 There were approximately 65 dulcimer players registered to compete. Like the other categories, half those registered show up and play. In the dulcimer competition, I would say a bit more than half the half are good players. The other half are what we call money-backers. They play to get a free weeks ticket to the Convention and well it sounds like it. I also call them cabbage boilers, because a good portion of them play “Boil That Cabbage Down” which is one of the easiest songs to play on a mountain dulcimer. Sometimes you will recognize it and sometimes you don’t. Some of these players share the same dulcimer, one would play and leave in the chair for the next person. I cropped Ed’s head but I did fix that, once I noticed. Diane was not totally happy with her performance, she started out a bit rough. Its pretty nerve racking being up on that stage in front of thousands of people. She corrected, did a quick restart and played well after that. The thing is its very hard to known what the judges are looking and listening for. We would not know for three more days what they thought. In the meantime, there were other things to do! I had a chance to put up one of my oldest kites, which inspired me to write a story about kite flying and I posted it a couple weeks later. Diane started a new basket. This was the first one she had made in years and she really looked forward to it. She would finish making it in the Chestnut Creek School of the Arts booth at the convention the next day. This demo would inspire people to sign up for her basket weaving class that she would be teaching at the school in just a few weeks. She did get a lot of interest, some folks wanted to buy the baskets she brought to show. Saturday night was the last night of the convention, the final band competition, followed by the announcing of the awards. Diane was not concerned about making the top ten. She was called to the stage, which was done in no particular order and stood there waiting to see what would happen. Awards were given out along with a cash prize in reverse order. She was awarded number nine. She wanted higher of course, but the competition was pretty stiff with the top 8 having some dulcimer players who taught at the college level, one played with the Charlotte Symphony and two each had over forty years experience. Diane is self-taught with four years. She did fine, and next year will do even better. After all a brand new dulcimer was in the works. Our old friends Doug and Nancy, who we met years before, when we members together of two RV clubs, came to visit us for a few days. We had dinner on our lot, went out to some of our favorite eating places and visited the Blue Ridge Music Center as well. It was a quick visit but a good one. Shortly after they left DCMR had its annual big Italian Dinner, which was really good. I like the deserts a lot. I had another day of kite flying, a new one this time, a Centipede, which became a companion to my Cheshire Cat kite. We went to the Rex to see a wonderful documentary about the music here, called Fiddlin’. It is extremely well produced and hopefully will be on Netflix or one of the networks as well as in theaters one day. Want to see more? Click HERE! The last thing we did during the Month of August was to take another trip down the New River. Gary and Becky had returned to DCMR for another visit and to do some awning work. We had to go out on the river again. They had a brand new Kayak and this would be its first voyage. It was a good one. It had been a very busy summer for sure. Now it was over. Our annual Labor Day Golf and Pot Luck was just a few days away. That would be the last Holiday Golf bash of the year. Many of our friends and neighbors were already making plans to leave and head south for the winter. I was not ready to even think about that! The fall is the best time to be here and we planned on staying for a lot longer. As a matter of fact we are still here as I post this. Let me finish this part of the story of this year with the last picture I took during the month of August. Posted from Cold and Rainy Deer Creek Motorcoach Resort.